Organisers of Nuart Aberdeen have made a ‘call for walls’ to identify city centre sites for new street art murals to be developed when the festival returns in 2018. The international award-winning festival made its debut earlier this year and a team of globally acclaimed artists showcased their talents by producing powerful murals attracting large crowds over the Easter weekend. Nuart Aberdeen was brought to the city by business organisation Aberdeen Inspired and Aberdeen City Council, and was supported by main sponsor Burness Paull LLP. In anticipation of the festival returning next year, work is already underway to find prospective new walls to use next year and the festival project team are keen to hear from property owners and business that would like to be involved. 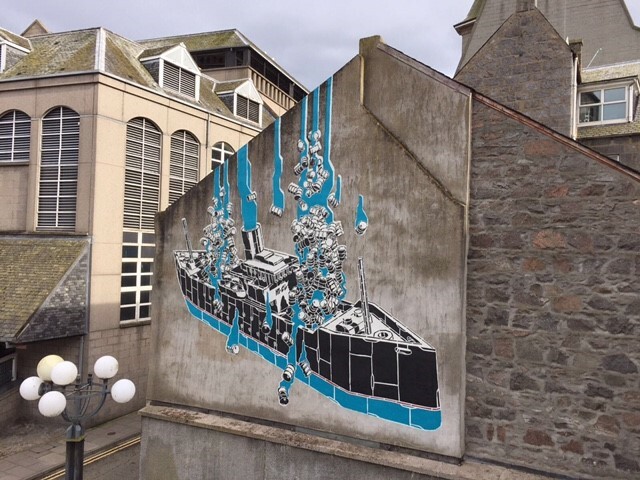 “We had an overwhelmingly positive response to the Nuart Aberdeen festival and it has been truly transformational, attracting significant footfall over the summer months. “We are delighted that the festival will be coming back and the festival team has started work to identify prospective new walls in the city centre for street artists to use next year. I’d encourage property owners and businesses in the city centre who would like to be considered to contact us. Held in the Norwegian city of Stavanger since 2001, and widely regarded as the world’s leading celebration of street art, Nuart Aberdeen was the first overseas version of the festival. “The artists, team and partners had an incredible first year in Aberdeen, a truly remarkable event that we took a lot of credit and accolades for alongside our partners, Aberdeen Inspired. “It’s always a little humbling taking credit for Nuart, because the reality is, the event is a huge collaborative undertaking between so many different talented and passionate individuals and partners. This is where our ‘call for walls’ comes in. It’s a truly democratic way to have the public and local businesses involved in where the art might be placed. Shaun Hose, Assistant Director of Rockspring, which owns Aberdeen Indoor Market, which was the centrepiece of the inaugural festival has encouraged property owners to come forward. “Rockspring have been fortunate enough to work with Nuart on three artworks which exceeded our expectations. The art is now an integral part of the Indoor Market space overlooking The Green and the trendy Merchant Quarter. “We are proud to have worked with Aberdeen Inspired and Nuart by providing them with a canvass to enhance the urban landscape and breathe life back into our building. The call for walls comes as discussions with Aberdeen City Council are ongoing to secure Nuart Aberdeen for the future. “Aberdeen City Council was both proud and delighted to be the joint delivery partner for Nuart Aberdeen this year. Aberdeen Inspired is the banner under which the Aberdeen BID (Business Improvement District) operates. It is a business-led initiative within the city centre in which levy payers within the BID zone contribute. Proceeds are used to fund projects designed to improve the business district.